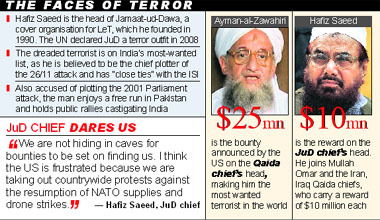 The US announcement of $10 million bounty on Jamaat-ud-Dawa (JuD) chief Hafiz Saeed�s head was today whole-heartedly welcomed by India, which again asked Pakistan to speedily act against the mastermind of the Mumbai terror attack. A 38-year-old Sikkimese was among the seven killed by a disgruntled college student who carried out an execution type killing spree in a California college that also left an Indian-American girl injured. Army Chief Gen VK Singh has sought a few more days to file a detailed complaint in the alleged bribe offer from a senior retired officer to clear a tranche of nearly 600 "substandard" trucks. Bowing once again to pressure from ally Trinamool Congress, the government has agreed to discuss the National Counter Terrorism Centre issue separately with chief ministers in Delhi on May 5 as demanded by Mamata Banerjee. The Ropar administration continued to carry out raids against those involved in illegal mining for the second consecutive day today and registered 12 fresh FIRs. While 10 persons were arrested, 29 stone crushers, which were operating without permission, were sealed.